You are here: Home>Archive>Iain Cawthorne Collection>Photographs taken by Iain Cawthorne of the designated area of Milton Keynes (c.1970s).>Photograph of farmhouse in Great Linford (1971). 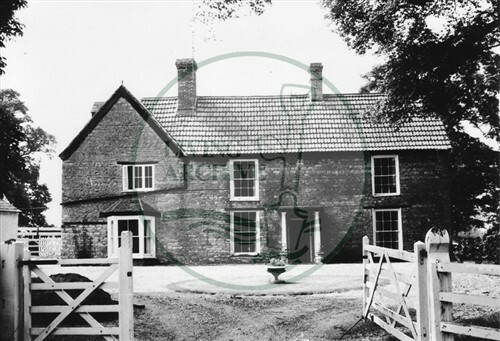 Photograph of farmhouse in Great Linford (1971). Linford Lodge was known as Ivy House, for many years it was owned by Dennis and Sally Ives who were friends of my parents. As you went into the drive, there was another set of gates on the left hand side with a gravel courtyard off of which were a paddock/field for horses, a stable block, feed/tack room, a riding arena and entrance to the laundry room/kitchen. Also led into part of the garden that went behind the house to the swimming pool and rest of the grounds. We used to stay there often during weekends and holidays so I remember the house. Much later on they converted part of the house into a restaurant – the house and whole area was peaceful and stunning – until the council came along and took theirs and the farmers land by compulsory purchase order and built the awful Milton Keynes. Needless to say Sally and Dennis sold up and moved after that. Re: picture ref SC ICC/001/083. This is a picture of Linford Lodge. It has no connection with the nearby Black Horse Inn located adjacent to Bridge 76 on the Grand Union canal.